Every spring Hasan Bacak, his wife, Emine, and their 1-year old son, Mehmet, migrate for weeks in search of higher ground for their livestock to graze. Theirs is a simple life shaped by the tempo of the seasons. They’re members of the Sarikecili, an indigenous nomad group in southern Turkey that moves every summer from the Mediterranean coast to the Anatolian mountains with their herds, chasing cooler climates as temperatures rise near the shore and become too oppressive for their animals. With 14 camels and about 250 goats, the family navigates rough terrain, tracing an ancient route forged by their forefathers. But climate change is altering the course and speed of their annual journey. There isn’t enough rainfall in the winter, so where years ago they stayed for days on end in on one spot, they now have to keep moving on a daily basis. The summer would be dry anyway, but Mikdat Kadioglu, professor of meteorology engineering at the Istanbul Technical University, says now winters are warmer and there’s less rain then to help things grow. Hasan, who was born in these mountains, has been a nomad his whole life and witnessed the changes firsthand. 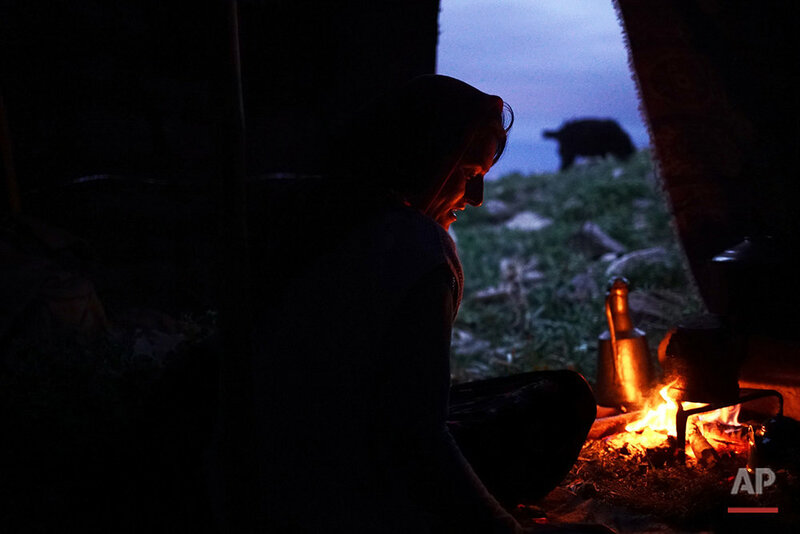 Ayse Hilal Tuztas, an anthropologist who did research on the Sarakecili, says there are around 150 families — about 800 to 1,000 people — left in Turkey who still live this traditional lifestyle. 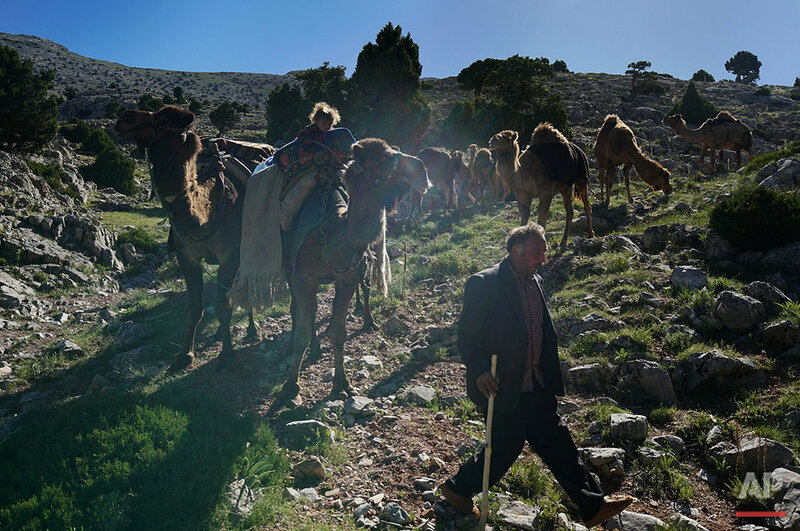 Every day, after a breakfast of bread and goat cheese, Hasan Bacak readies the camels, while his wife sets off with the goats, cutting a path across a jagged landscape. Packing up every day takes a toll, especially with a baby, he says. 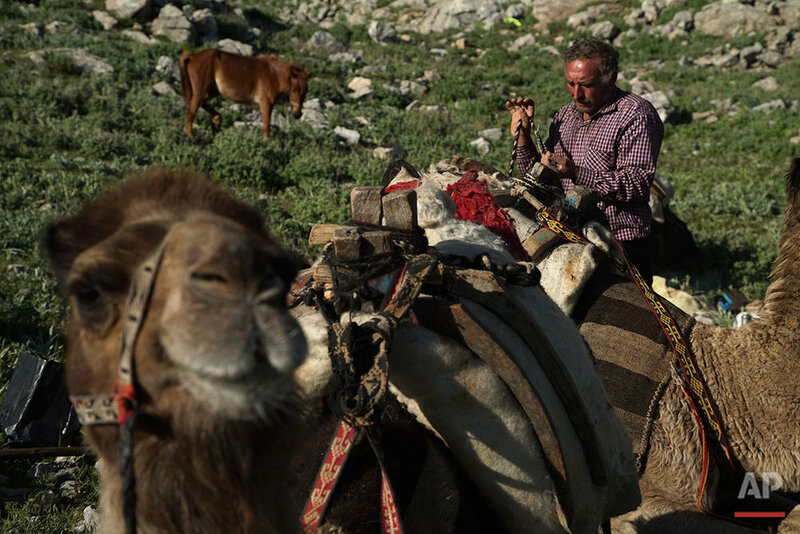 Text from the AP news story, AP PHOTOS: Dry conditions in Turkey affect nomadic lifestyle, by Bram Janssen. Spotlight is the blog of AP Images, the world’s largest collection of historical and contemporary photos. AP Images provides instant access to AP’s iconic photos and adds new content every minute of every day from every corner of the world, making it an essential source of photos and graphics for professional image buyers and commercial customers. Whether your needs are for editorial, commercial, or personal use, AP Images has the content and the expert sales team to fulfill your image requirements. Visitapimages.comto learn more.